Are Monarch Butterflies in danger of extinction? As a species, monarchs are native to North America, but subsequently island-hopped their way around the world—across the Pacific to Hawaii, Tonga, Samoa, Australia and New Zealand, and across the Atlantic to Europe. In parts of Mexico, particularly in the area around Lake Chapala, there is a healthy population of non-migrating monarch butterflies; these butterflies can count on year-round access to milkweed plants on which to lay their eggs. As a result, it is reasonable to conclude that the species itself is in no danger of extinction. However, what may be “endangered” is the annual migration of Monarch Butterflies to and from Mexico. This annual migration is categorized as an “endangered phenomenon” by the International Union for Conservation of Nature. Threats to the migration come from climatic change and extremes, as well as from the impacts of human activity. In some years, unusually cold snaps and hailstorms have caused the premature death of millions of butterflies, though, as yet, this has had little if any discernible effect on total monarch numbers. 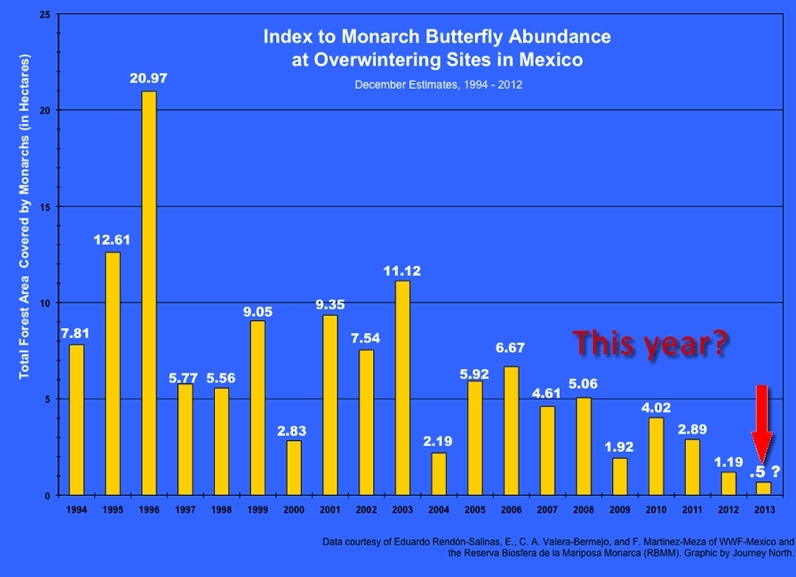 Human activity has greatly reduced the area of the monarchs’ natural overwintering habitats, in both California, for real estate developments, and in Michoacán, due to forest clearance for timber and agriculture. Farming activities in the US have also resulted in the loss of milkweed along the Monarchs’ migratory pathways. This loss may have far more serious consequences on the long-term viability of the annual migration. Without milkweed, the female Monarchs are unable to lay their eggs on a suitable host plant, and the Monarch caterpillars will never acquire their chemical defenses against predation. The challenge for researchers is to be certain that the density and architecture of trees is similar from one year to the next. If the trees are less densely grouped, for example, one year than the next, in the particular areas occupied by the butterflies, then the area the butterflies need will be correspondingly larger. The lower area in recent years could be at least partially explained by a higher tree density in the overwintering areas, allowing the same number of butterflies to co-exist in closer proximity to each other. This is not to say that there is not cause for concern. According to the National University (UNAM)’s Environmental Geography Research Center, at current rates of deforestation, the area of overwintering sites for the Monarch butterflies could be reduced by 75% in the next 18 years, leaving just 12,000 ha of suitable habitat. The protected area, established in 2000, covers 560 square kilometers (56,000 ha. or 216 sq. mi) but includes land cleared for pasture, settlement and cultivation. Researcher José López García claims the reserve is losing 3% of its forest each year. He blames clearance and changes of land use more than illegal logging. The rate of forest clearance has been exacerbated by a rapid rise in the population of the El Rosario ejido. El Rosario is the gateway to the most-visited part of the reserve, attracting thousands of tourists annually. The ejido’s population rose by an average of 5.65%/year between 2005 and 2010. What is Mexico doing about this? The Mexican conservation strategies for the butterflies are designed to protect their overwintering habitat and provide alternative sources of revenue and employment for local campesinos who depend on the land and forest for their livelihood. After some doubtful years in the early 1980s, there is now a system of formally protected monarch butterfly reserves, and concerted conservation efforts to prevent further destruction of the monarchs’ unique overwintering habitat. The modest entrance fees to Monarch Butterfly reserves help fund development projects in the local communities. There is a strict code of conduct for tourists to prevent noise, littering and straying from the well-marked paths. While the new rules have undoubtedly had some success, it is still preferable to visit, if at all possible, during the week and not at the weekend when the reserves are at their crazily busiest. On a quiet day,pausing to catch your breath in the peace of the forest as you climb the trail, you will then be just as surprised as I first was when you realize that the gentle swishing sound you can hear around you is not the sound of the wind blowing through the tree limbs but the sound caused by millions of tiny wings beating as the butterflies flutter about in the sky. The Ghost Train (El Tren Fantasma): a case study of the geography of sound in Mexico Which states are growing fastest?